PowerShares QQQ is probably the most known exchange traded fund in the world. It tracks the Nasdaq-100 index and is a very handy tool for all types of traders and investors. It is also very popular in the day-trading community and is heavily used in intra-day strategies. I use this index to monitor of large cap technology stocks. They serve as a major indicator of investors mood about technology sectors on the US stock markets. I personally use the QQQ together with the second major index exchange traded fund, the SPY. I monitor their behavior during a day and try to find which one is relative stronger or weaker. Then I include general market mood and try to select the ideal ETF for intraday trade. My ETF daytrades are based on breakout or pullback strategies. They use the first 10 or 15 minutes as a time-range for setting the base for intraday price support or resistance. The breakout of these levels are then used to initiate a QQQ daytrade. These my ETF strategies are again based on relative strength or weakness. I use it together with other exchange traded funds that I have in my ETF list. My ETF selection method is used to select the best ETFs and sometime the QQQ is selected as the best pick. Here is the list of top seven most liquid Powershares exchange traded funds as of March 10, 2013. 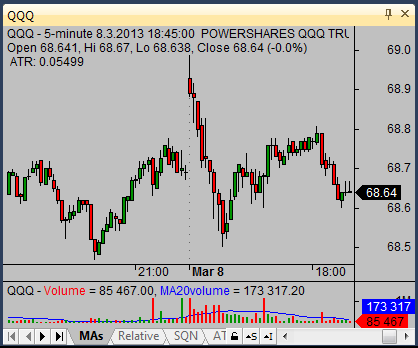 As you can see QQQ is very liquid and so it is a very good vehicle for intraday ETF trading strategies. But other funds offer also plenty of liquidity for short-term strategies.